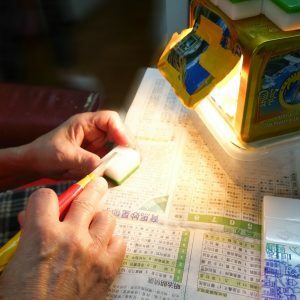 When we talk about mahjong making, most people may think of the plastic (acrylic) materials and characters made by hand-carving masters with family shops at streets. However, not many people know the secrets of how to make mahjong tiles in a manufacturing factory in the old days of Hong Kong. “Fuk Hing Lung” (復興隆麻雀廠) used to be one of the leading mahjong tile manufacturing factories in family business in Hong Kong. My grandfather was an apprentice when he was very young. He setup mahjong manufacturing business in 1950s. The factory was moved to Kowloon City in 1963. The business was passed to my father who witnessed the growth of Hong Kong manufacturing industry in 1980s-1990s. During the peak period, it achieved half proportion of mahjong parlors’ business with restricted no of licenses given to 99 parlors only. 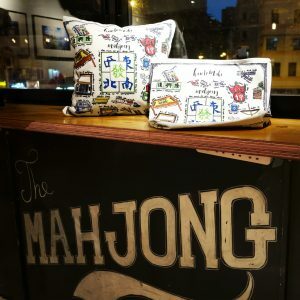 The mahjong tiles were also supplied to some restaurants, hotels and club houses in Hong Kong. 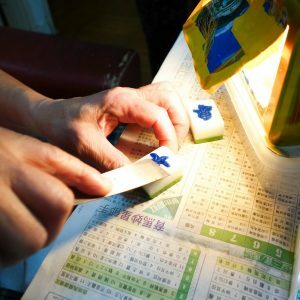 How to manufacture mahjong tiles? Let’s take a closer look of my family members’ manpower in the mahjong factory in 1980s! What were the making tools of hand-carving mahjong tiles? That’re a lot of efforts put in for one set of mahjong tiles indeed. 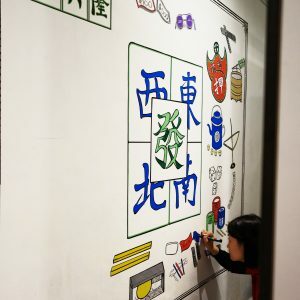 While this manufacturing industry is unlikely to come alive again in Hong Kong, we are committed to keep Hong Kong culture and family ties alive through art with mahjong features. Thank you for your valuable support to us! I m never keen on playing mahjong. My friends know me well. But the first time I started painting on mahjong tiles was 11 years old. It was taught by my mom. “Mahjong was a very popular game among Chinese. My grandfather was a very hard working person who set up a mahjong manufacturing factory since the 1960’s. 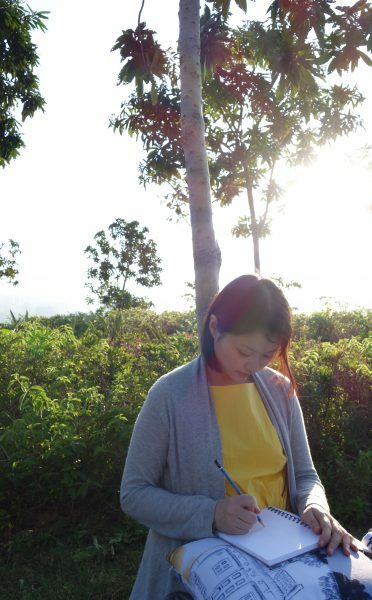 The business nature was special and rare in Hong Kong. The mahjong tiles were produced to supply many big mahjong chain shops rather than the small retail shops but the production processes were also more complicated. My father succeeded this business and the factory became one of the largest mahjong manufacturers in Hong Kong during the 1980s to 2000s. It was an uncommon industry with different types of technical and handcraft skills. Unfortunately, the economy went very bad since 2000s. Intensive competition with very low labour cost from the Mainland China led to the shutdown of the whole business despite all the efforts that my family devoted into the business. 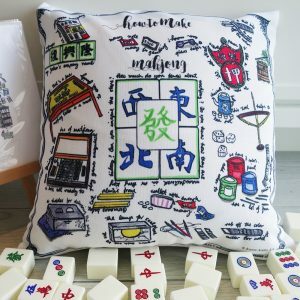 For me, it is always my wish to do something related to mahjong theme and add new and interesting values on it, in order to preserve one of Hong Kong’s most traditional handcraft. 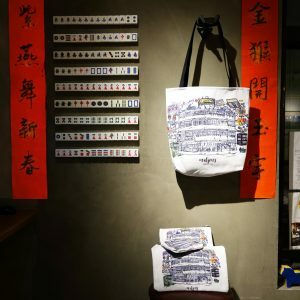 This is a meaningful act to keep memories and show appreciation to my family’s contribution to Hong Kong handicraft value. “What should I do?”, “How can I help to preserve Hong Kong people’s history?”, I kept asking myself this question for the last 10 years. 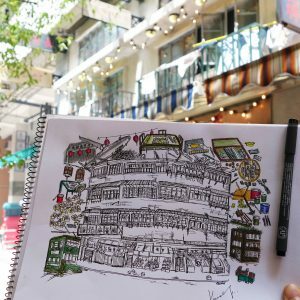 One day, I suddenly made up my mind and drew two artworks related to ‘How to make mahjong’ theme: one is to sketch the district where the mahjong factory was built at Kowloon City. 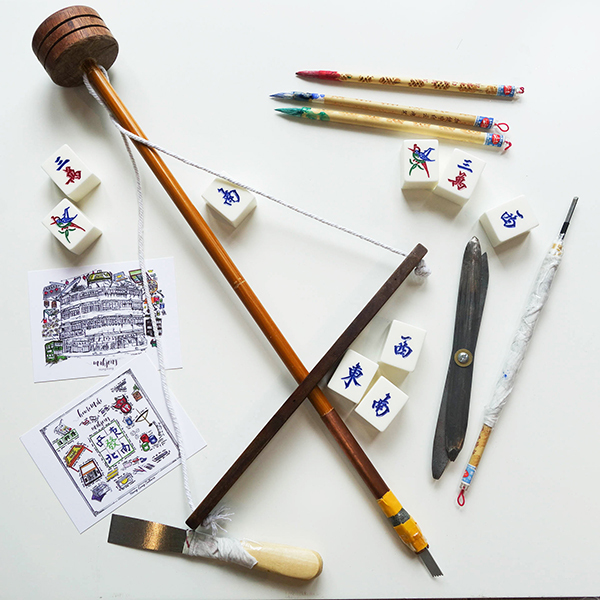 The second artwork is to draw the tools and describe the whole manufacturing process of making mahjong. It is a very interesting idea indeed to tell people the old production processes and the tools in a modern way. Many people love this fashion design. That is really amazing! I tried to create something in a more modern style, while keeping the traditional elements of Mahjong culture. After sketching and painting hand, my design will be able to preserve the story with the hand-drawn illustration. 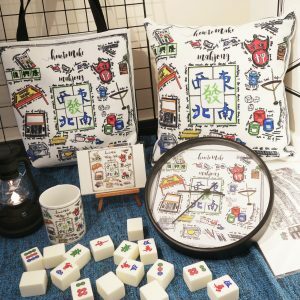 Now, I am so happy that my products have gained the support of the “Mahjong Hostel” and they are on sale to the tourists coming to HK. This is the 2nd year they are ranked no.1 on their list of Hong Kong Specialty Lodging. The selling is good and many tourists are interested in these products. 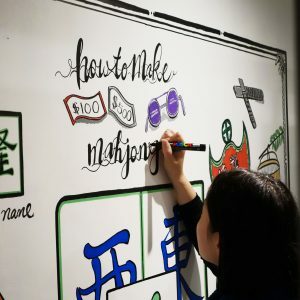 Apart from that, my design is also illustrated and featured on a big wall at Mahjong Hostel. 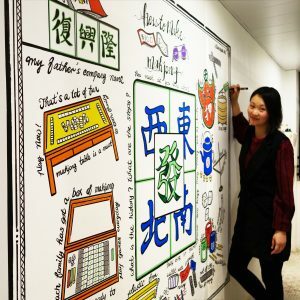 I would like to say thank you to Mahjong Hostel for such a wonderful opportunity because the doodle wall helps to preserve all the secrets behind the manufacturing processes- a part of Hong Kong traditional handicraft industry! 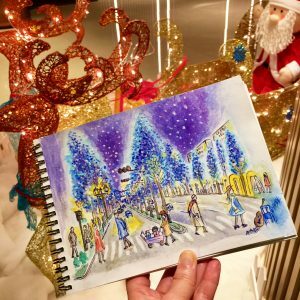 If a picture is worth a thousand word, an art journal can show travel lovers thousands of words of an amazing trip in just a minute. 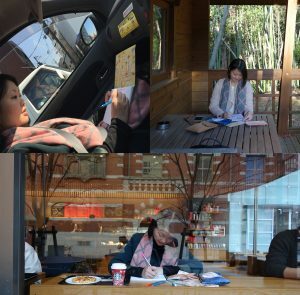 While art journal is very common in western countries, there aren’t too many postage of sharing in Asia. 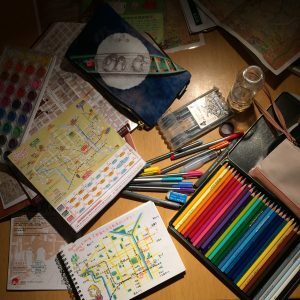 So, how did I work out an Art Journal for a creative trip? 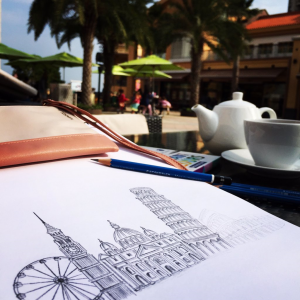 To start with, bring some simple drawing materials which are easy to carry for the trip like watercolor, ink pens, maps, pencils, camera and an art journal sketchbook. 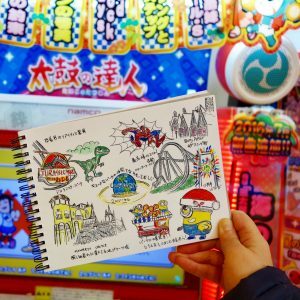 Start the illustration while flying on the plane and take the first photo immediately after landing in Osaka. 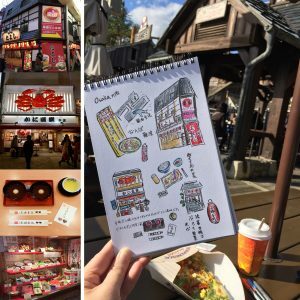 I try to make full use of the time during lunch period at Universal Studio theme park. 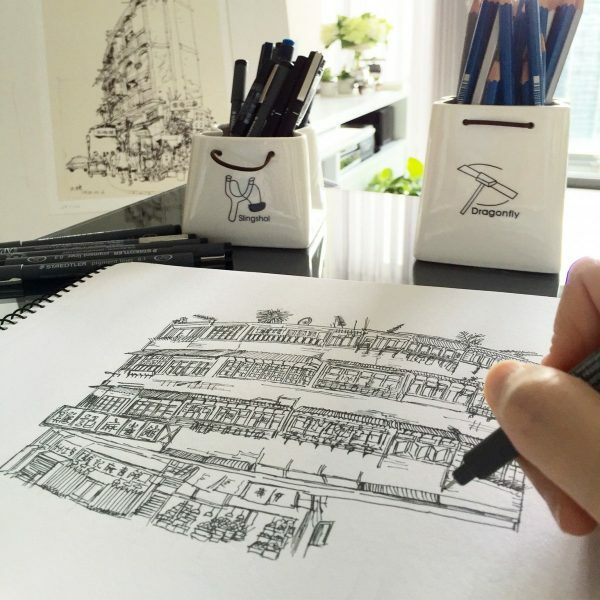 A multi-tasking mission, playing and drawing all go together. 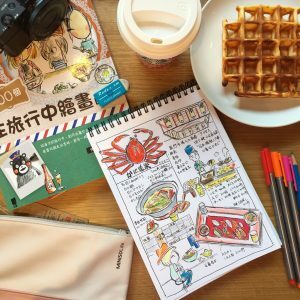 Record what I have eaten by taking photography and then finish the illustration for a gourmet tour! Watercolor pencils are very easy to use materials to fill in colors quick after sketching. 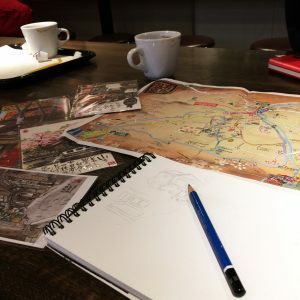 I try to draw something creative by sketching the map of Kyoto. Add some colors to make it a lovely style. 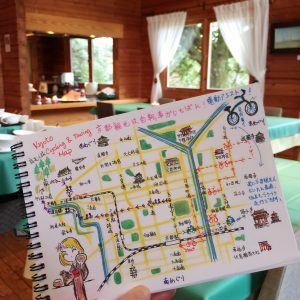 Highlight the routes of cycling and hiking tours on the map that show people where I have gone. 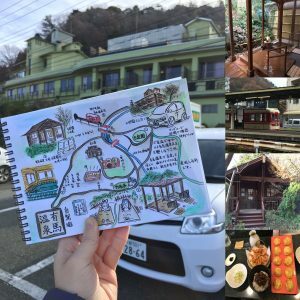 After finishing Kyoto’s visit, draw another driving map for Arima hot spring…..pencil sketch and watercolor effect are the best to represent the natural environment. 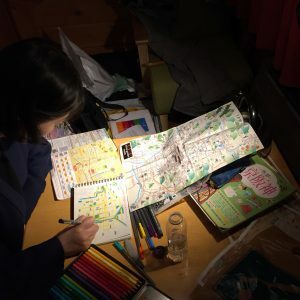 Finish the final drawing with a beautiful night view. In fact, never giving up to draw whenever there is a short break. This adds passion for me to complete the artwork within the trip. I m so happy that I can finish my first art journal within the travel as it really added a lot of fun to the trip! With a sketchbook on hand, I m ready to draw anything that crosses my path from now on. 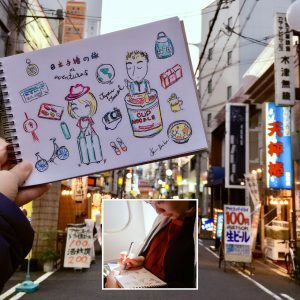 When I start publishing my artwork, most of them are combining photos and sketch features, that’s why the first collection of ‘Travel with Pencils’ is created. We all love great experience, and we want to try new ideas. 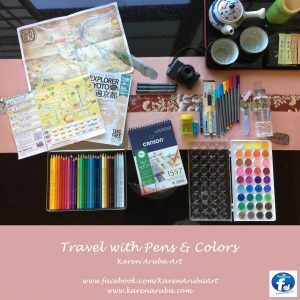 So, I start to develop another collection ‘Travel with Colors’ by adding color. Currently, I have a new collection in ink pen drawing – ‘Travel with Pens’. 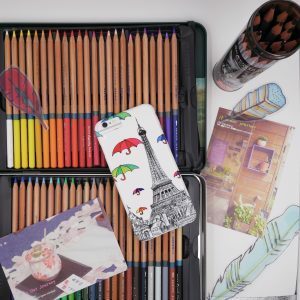 No matter what collections they are, they are all related to the ‘TRAVEL’ theme as ‘travel’ can inspire one’s life, can bring people happiness. A travelling is not necessary restricted to a place, it can be a pleasant journey, an imaginative travel, or even a memory of history – a real travel and refresh in our mind. 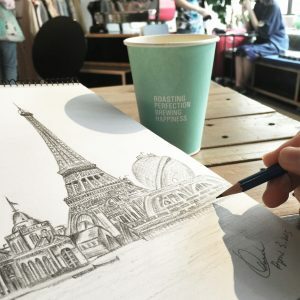 How do I maximize relaxation through drawing? 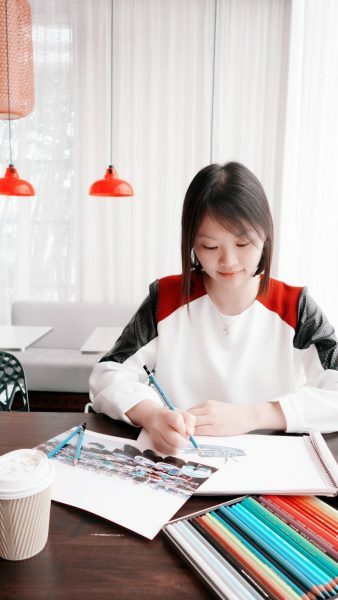 For me, personally, I love to draw in a nice western restaurant or outdoor area, which has beautiful scene & setting, a comfortable seat with tons of natural light. I used to find a spacious place and make sure I won’t be disturbed. Recently, I have built an art corner at home, facing to a big window with plenty of natural lights. 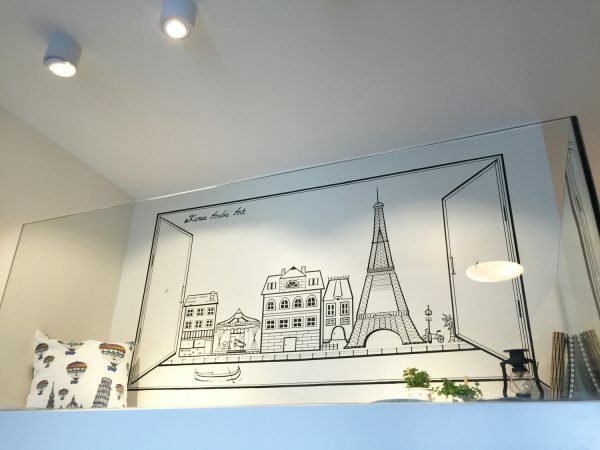 With the doodle drawing on the wall as the backdrop of the drawing scene, that is a perfect area for brain storming. What materials do I use to draw with for my products? Many people ask me this question. My number #1 go-to-materials for drawing is ‘pencils‘. I love pencils because they deliver a natural and simple feeling. 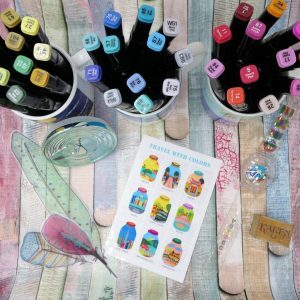 There are a wide range of art supplies you can use. 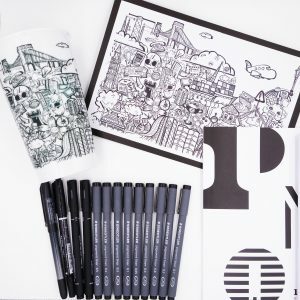 Recently, I’m addicted to ‘ink pen’ drawing. The whole artwork looks solid and outstanding in black and white and it’s a very good choice if you like cool ideas. 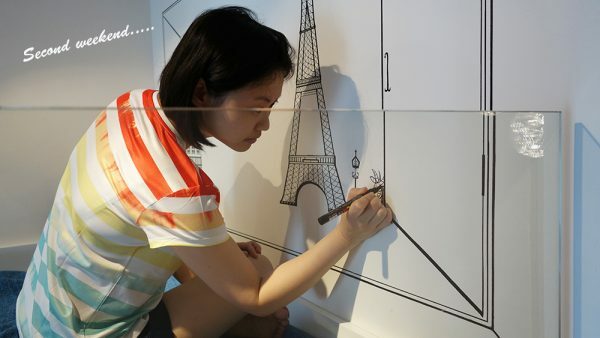 If you want to try some crazy idea, use ink pens and doodle on your wall! Trust me, that is a very amazing experience and cool idea indeed. People love this creativity. Colored pencils are also my favourite tools, which are actually ‘watercolor pencils’. I have 3 color sets, but the price of all sets is not expensive. Colored pencils are easy to use. The effect is very surprisingly good if you add a little water to your page. If you use just a tiny bit of water, they can be used with normal paper and it can make your colors smooth. ‘Art markers’ are also very easy to use and they have sharp and outstanding color effect. 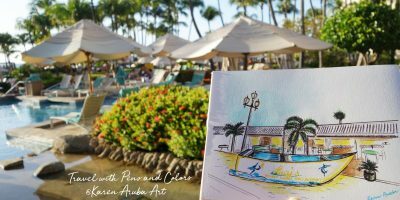 If you want to draw something brilliant to capture people’s eyes and attract them with a smile, art markers are definitely an ideal option. 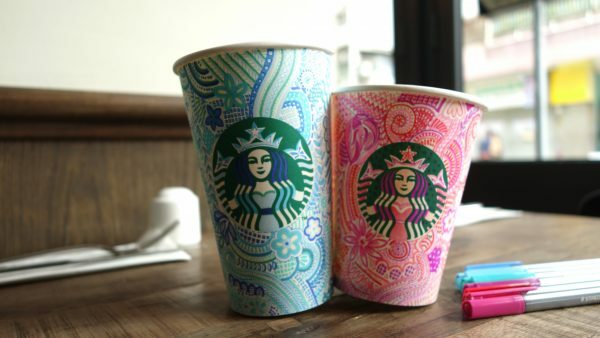 Starting from today, let’s try to draw something on a coffee cup with zantangle pattern and the color looks brilliant!! All these drawing tools are not difficult to use. 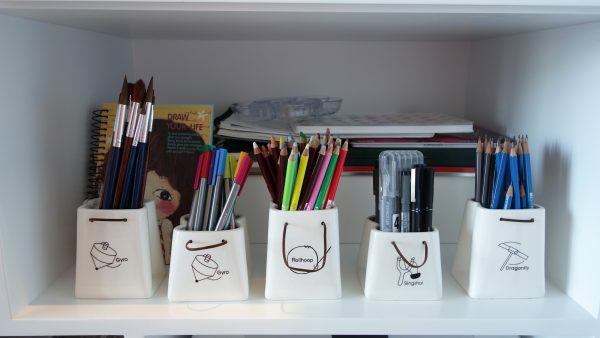 They can be found at art supply stores easily. The most important thing is how to make use of these tools in your creativity mind. 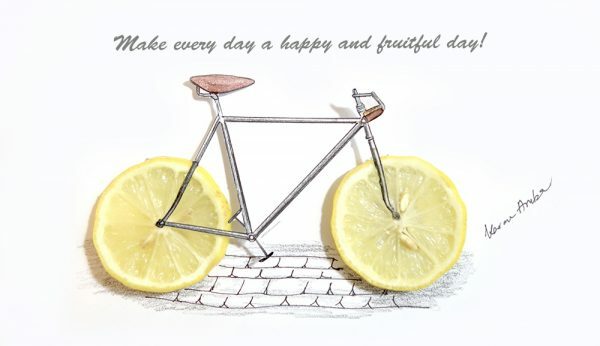 I hope the sharing of my work will bring you some energy in your life! Check out my facebook, twitter or Instagram for creative art ideas from time to time.